There is a system that allows you to obtain individual designs right when several variations of a design were created based on one design concept during the process of development. 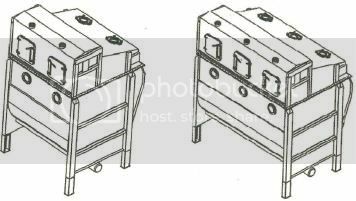 These two drawings both show dyeing machines, the overall structure of both designs is the same and the only difference is the number of units. Therefore these designs are called similar designs of the same product. In this case it is possible to register several design variations by declaring one design as basic design. A certain design concept can be legally protected even stronger. Such systems for related designs exist in Japan, China and Korea but there are differences. In China the systems for related designs was established by the law revision in 2009. When a design B, similar to the basic design A, is registered in Japan and China, like shown in the diagram on the right, the design right is in force for the range of similarity of both designs. That means that there are individual design rights for the related designs and you can legally protect the design concept even stronger. On the other hand in Korea, the scope of the design right of the basic design A is not expanded and the design right B is combined with the right of basic design A. Thus, only the scope of similarity for basic design A can be confirmed. Next, regarding the requirements for related designs, from several variations one has to be designated as basic design and the others are filed as similar designs. If the other designs are not similar to the basic design they cannot be registered as related designs. In China the term for filing related designs is limited to day the basic design was filed, but in Japan, since the law revision in 2007, as longs as it is before the publication, you can also file related designs after the basic design has been filed. Accordingly, it is possible to file a regular design application and related designs later. However, if the filing date is different, only a prior design can be designated as the basic design. In Korea there are is no term for filing related designs. As long as the design right of the basic design is in force related designs can be filed anytime. The requirements for filing related designs in Japan have been relieved, but the novelty is judged at the point of filing as it used to be. If implementations of the basic design similar to the related designs have been made public before filing, the related designs lose novelty. Therefore you cannot register them as design patents, but if you file the related designs within 6 months from the publication of the design, you can avoid this problem by applying the exception of the loss of novelty regulation.